Mary Catherine needs a heart transplant yet ignores the doctor’s advice and moves to Uganda to work at an orphanage. She wants to spend any time she has left helping children. Marcus Dillinger is a Major League Baseball player who has stolen Mary Catherine’s heart. Tyler Ames and Sami Dawson are friends of Mary Catherine’s, yet she has not told anyone about the doctor’s recommendation. Marcus has a gut feeling that something is not right. Can he travel to Uganda to find her and get her to a US hospital before it’s too late? Tyler plans to ask Sami to marry him. Why is their love in jeopardy? How has this group of friends touched the wings of the angel’s walking with them? Buy the book HERE. 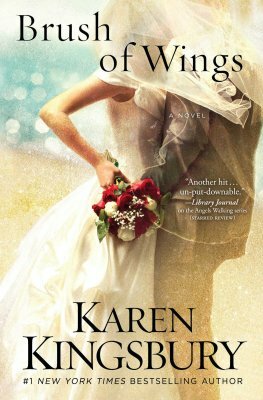 Karen Kingsbury is a #1 New York Times Bestselling novelist with more than 25 million books in print. She is America’s favorite inspirational storyteller as her last dozen novels have hit top spot on national bestseller lists. Several of Karen’s books are in production as theatrical and Hallmark original movies. Karen lives in Nashville with her husband and five sons, three of whom were adopted from Haiti. They live nearby to their actress/designer daughter, Kelsey who is married to Christian recording artist, Kyle Kupecky. In addition, Karen is a visiting professor at Liberty University, where she teaches master classes on storytelling. She and Kelsey also have a card and gift line called “Possibilities” which is sold at retail stores everywhere. Learn more about Karen HERE.